Our employees are highly committed and competent. They put our ambitious safety standards and our high service quality into practice with all services, from the arrival of an aircraft to its departure – reliably day by day. Always one step ahead: LOSCH only uses technical equipment of the highest quality standard and develops it further: Innovative strength for more safety on aprons. 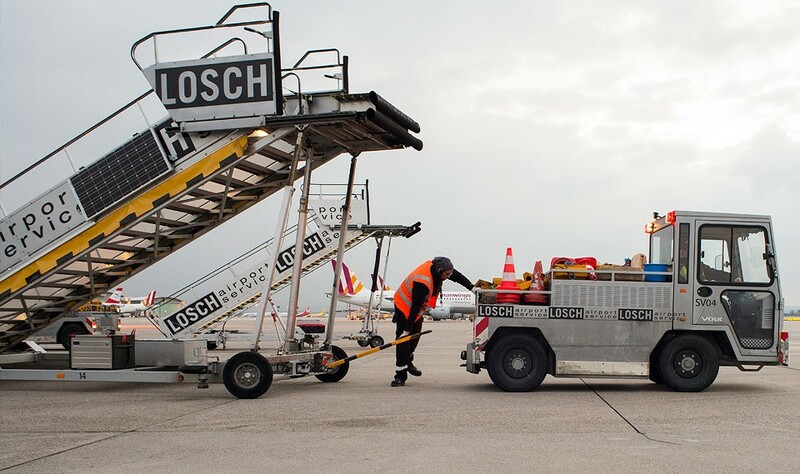 For 25 years, and still unique: LOSCH is the only family owned company in the area of aviation in Germany. The down-to-earth basic principles from then still apply today: Be hands-on, listen and keep your promises! We always strive for long standing customer relationships. And we know: We can only achieve this through optimised service and trusting cooperation. Our customers always confirm that our reliability is the basis for their loyalty! Losch has been a reliable partner for us for many years, who delivers quality. Additionally, Losch surprises us time and time again with a great talent for improvisation and great personal commitment! The value system - transferred from father to son - simply fits. Whether you look at the check-in employees or the managing directors - everybody at Losch is friendly and has a smile on their face - plus always an open ear for individual needs and desires of clients. This personal contact, paired with great professionalism, modern and efficient equipment as well as great awareness for safety is the basis for the success story between Condor/Thomas Cook and Losch in Stuttgart. Losch is a family enterprise par excellence: close to customers and employees alike, and its sense of togetherness is lived every day. Furthermore, we can make decisions swiftly and tackle issues efficiently: When a large service provider miserably let us down in autumn 2004, Werner and Marc Losch established in cooperation with their partner enterprise Heico Aviation a completely new handling operation and even a de-icing solution within a few days. Since then, the operation is running smoother than ever before! Experienced in all work steps, attentive to particularities, and conscientious towards all safety regulations. We adhere to the ground handling time requirements of our customers, even if they are tight. The crews can rely on our supervisors. Diligence with express freight: Airfreight turnover in Stuttgart and Munich has very short cycle times and requires high sorting quality. Whether express or standard: Our employees work swiftly and carefully, night by night. The passenger’s first glance at the cabin is important. Even at the fourth and fifth glance, we want to stand out by excellent hygiene and cleanliness. We have learned aircraft cleaning from the bottom up, and perfected our processes in over 25 years. Our teams work quickly, but with an eye for the detail.